The study was carried out in an experimental mouse model of multiple sclerosis. “We used an in vivo imaging approach, which allowed us to distinguish between different phagocyte phenotypes in vivo on the basis of the expression of different fluorescent proteins,” says Kerschensteiner. “With the aid of this method, we were able to track individual cells and monitor their phenotypic identity in real time.” This approach revealed that pro-inflammatory phagocytes are found, as expected, at the sites of developing lesions, while the differential fluorescence marker expression indicated that the phagocytes associated with resolving lesions have an anti-inflammatory character. By tracking individual phagocytes continuously, the researchers were able to observe that this phenotypic difference was not due to the successive recruitment of two different cell types – as had been suggested on the basis of results from other model systems. Instead, single phagocytes in the central nervous system can switch from a pro- to an anti-inflammatory state, depending on the nature of the local environment. “In subsequent experiments, we demonstrated that this phenotypic conversion is induced by signals from the central nervous system, in particular by soluble factors secreted by cells known as astrocytes,” Kerschensteiner explains. 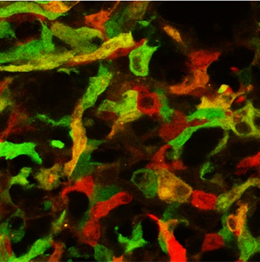 The discovery should enable researchers to obtain a better molecular understanding of the phenotype switch, and allow them to explore the therapeutic potential of targeted manipulation of phagocyte populations in the management of neuroinflammatory conditions.